In recent years, the current range and area of the Erlitou site have been basically made clear. Also, a road system in a“井”shape, the imperial palace, the walled workshop area and the turquoise workshop were found outside the palace district. While, several large-scale architecture complexes with central axis layout dating to the early and the late period of the Erlitou Culture, and several noble tombs with elaborate grave goods were found in the palace district. Combined the above work with the information from the exploration and excavations in the earlier years, we knew the cultural connotation, the layout and the change of some parts of the site over times. We also made clear the entire layout of the site. In order to know the detailed features of the site, the Erlitou working team, IA CASS, explored and excavated the palace district of the Erlitou site from the spring 2010 to the spring 2011. The explored area was located in the north of the palace area and it covered about 3ha. Through exploring, the distribution of the cultural remains in the north of the palace district was basically made clear and these cultural remains included a giant pit, 3 places with ash concentration distribution, large-area rammed earth and several road surfaces. The giant pit was located in the northeast of the palace district. It was 3-5 meters to the west side of the east wall and 13 meters to the north wall of the imperial palace. Moreover, its plan shape was close to a square with 66 meters long in east-west and 33 meters wide in south-north. The total area of this giant pit was about 2200 square meters, and its depth was generally 4-4.6 meters but the deepest place reached to 6.7 meters underground. The three places with ash concentration distribution were located in the north and northeast of the imperial palace and their areas were about hundreds of square meters individually. The excavation area was located at the No.5 foundation which is in the east area of the middle part of the palace district, and the east and west sides of the giant pit which is in the northeast of the palace district. 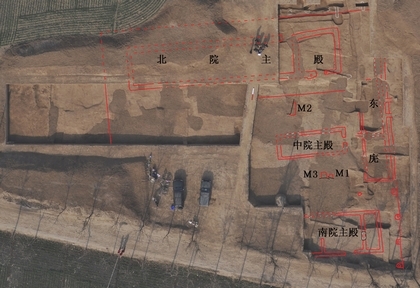 The southeast part of the No.5 foundation had been disclosed in 2002, while No.3 foundation is parallel with it in east-west direction with road and drainage ditch between them. The excavation of the No.5 foundation showed that it was a large-scale rammed-earth foundation. Its top rammed-earth was about 48 meters in east-west and 45 meters in south-north in the excavation range, so its total area was more than 2100 square meters. The current stratigraphic relationship indicated that the construction, supplemental construction and using date of the No.5 foundation all happened in the Phase II of the Erlitou Culture. 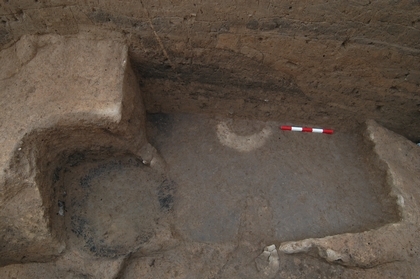 As with the No.3 foundation, the noble tombs dating to the phase II of the Erlitou Culture were found within north and middle court of the No.5 foundation respectively. The tombs were large-scale and some luxurious artefacts were unearthed there, including turquoise, lacquer goods, and lots of potteries (including white potteries). These tombs were under the Han cultural stratigraphy and destroyed the rammed-earth and the road layers belonging to the No.5 foundation. They are the important materials for studying the burial system in the Erlitou Culture, the date and the characters of the No.5 foundation. The east and the west sides of the giant pit were test excavated. The roads both inside and outside of the walls of the imperial palace which is in the east of the giant pit, were paved with red burned earth and calcified lime stone, and the date of the roads was later than the formation age of the giant pit. There were the continuous deposits from the late Phase I to the late Phase IV of the Erlitou Culture in the giant pit, but the remains dating to the Phase II of the Erlitou Culture is the main deposit of the giant pit and its total depth is about 1-3 meters. 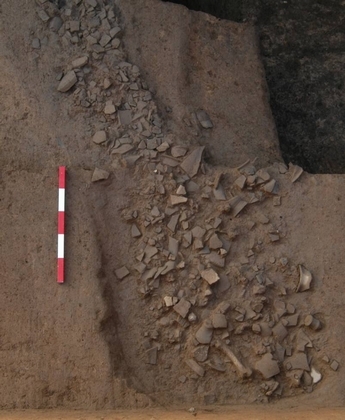 Many cultural remains were discovered, including activity surfaces covered with large quantity pottery shards, sacrifice remains with pig offerings, house foundation whose floor was rammed and burned, a kitchen range and hard road surface due to a long-term tread, etc. There were three sacrifice sites with pigs as sacrificial offerings. One of them was composed of three entire baby pig skeletons and several mandibles of baby pigs. 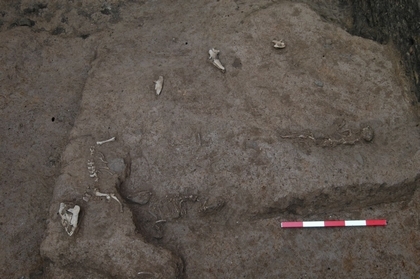 Three baby pigs were laid together, facing to the left side. Two of them were laid very close and facing to each other in south-north direction. One head is nearly facing to the south and the other to the north. They were all about half years old. In the Phase IV, there were road surfaces partly covered with pottery shards. Some stems of plants, trace of rotten leaves, silt rust trace were visible in the multi-stratigraphy deposit in the giant pit. These showed that this pit was immersed by water for a long time. According to the analysis to the texture and color of the earth in many places, we considered that the giant pit was formed in order to solve the earth needed by the construction. It formed no later than the Phase II of the Erlitou Culture. After the giant pit was formed, some activities, such as sacrifice and resident, were ever held, so that pig bones used for sacrifice, house ruin and road surface were left. 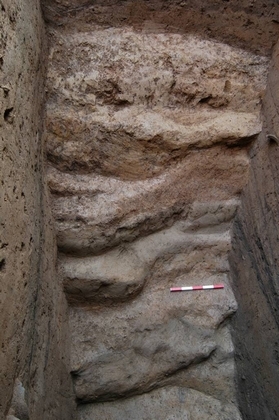 Later on, it was gradually silted up, filled up and full until Han Dynasty.